There is a story behind every book, and this series charts the stories behind the books I have written. Also, you will find out who has been interviewed during my research, and establish how those interviews have become inextricably linked with the subject matter. First up, it’s the turn of the Porsche Carrera book. Back in the mid-90s I was still living in Johannesburg, South Africa. I had been a motoring journalist since the early 1990s and we had a large house with a big, spacious office, ideal for hanging loads of motor sport posters and photos on the walls. Having posters on my walls had been part of my childhood as my bedroom was plastered up with photos of sports cars and motor racing for as far back as I can remember. So there I was, looking at a poster on the wall sitting in my office, and the idea for a book popped into my head, it was a light bulb moment. The title, Porsche: The Carrera Dynasty, was born! The problem was that being based in SA, you were about as far away from the European publishing world as you could get. I didn’t imagine that any publisher in SA would be interested in the idea, and not knowing any UK publishers, I simply filed the title in my ‘ideas’ folder on my computer, and there it sat. 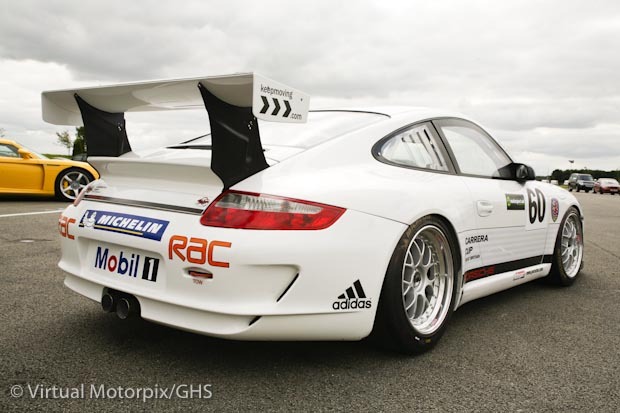 Fast forward about eight years, and I was working in my living room/office in the UK writing up some motor racing story, and the idea of the Porsche Carrera book surfaced once again. This time though, I was able to do something with it. I contacted the editorial department of Haynes Publishing and, to cut a long story short, I was sitting across the editorial director’s desk a couple of weeks later and we agreed to go ahead with the book project. After doing three leaps for joy in the car park, I called home to share the good news. The contract came through the post box a few weeks later…and I was on the road to my first book. In a nutshell, the idea was to chart the history of the name ‘Carrera’ throughout Porsche’s history from the early 1950s right up to current, which was then in 2004. 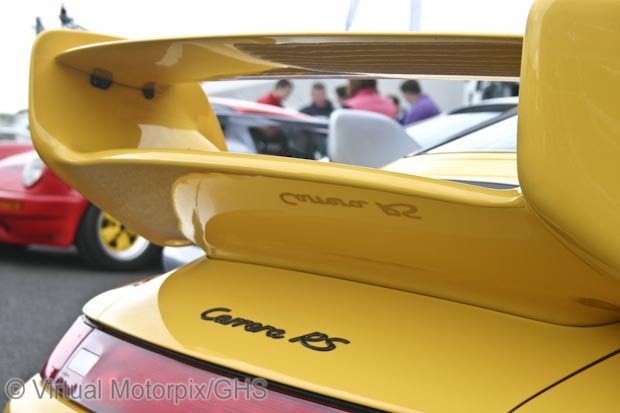 The name Carrera has over the years, been used by Porsche in reference to its race engines, as a model name on its higher performing road cars, but also latterly as a permanent model name in the 911 range. And so I thought there would be an interesting story behind how the name has been used for different things over the years, and even the reasons why the name disappeared altogether at some point. Porsche was not a manufacturer I knew much about because back in SA you didn’t see too many of them on the road thanks to the 110% import duty on foreign cars. Jaguar was my favourite marque, but more of that in another blog. So I had to start from the ground up, learning all there was to know about the Porsche brand, and never having written a book before, I thought the best place to kick off my work on the Porsche Carrera book would be at the Porsche Archive in Stuttgart, Germany. Now fortunately I am married to a German, and combined with my Afrikaans, I could make myself understood…just! A trip to Stuttgart was duly booked, and upon arrival I got stuck into finding out about the brand, the people and most importantly, the cars. This was back in the days when the Archive was in an old building across from where the new Museum is today. I interviewed folk there and photocopied all that I could, and as my stay straddled a weekend, I was given two press passes to visit the Stuttgart Retro Classic in the local town hall, which is where I had the privilege of interviewing Porsche legend, Herbert Linge, on both the Saturday and the Sunday. This was arranged ahead of time with the help of the Archive Manager. 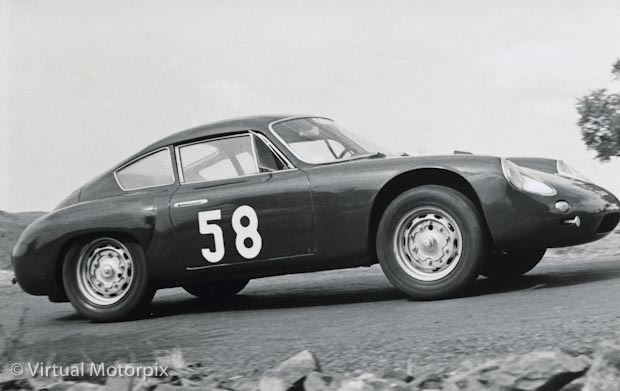 Linge of course was present in Mexico when the first 356s competed in the Panamericana, and basically never left the company. He served as the chief test driver, racing driver, mechanic, teacher, race series manager, the list goes on…it was such an honour to talk with him. Other interviewees included Jürgen Barth, racing driver, customer racing manager, test driver, BPR series manager and author. 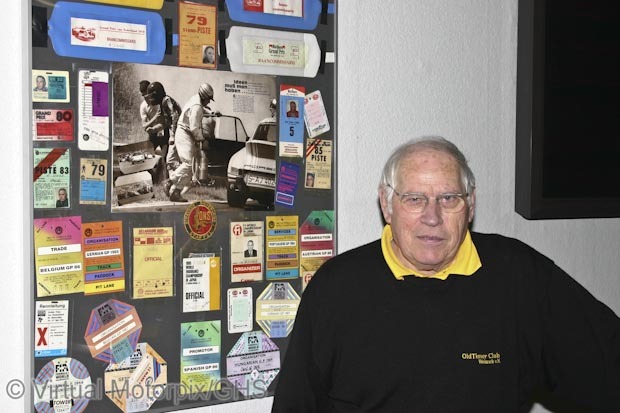 Rolf Sprenger was the manager of the ‘Special Wishes’ department, so he was the man in charge of carrying out customers’ special wishes when it came to personalising their cars, new or old. Klaus Bischof was one of the original mechanics on the first 917s and has held numerous and varied posts within the company. More recently he has been put in charge of the Museum’s moving road show. Tony Lapine gave me his views, by telephone, on the design of the 911 Carrera during his tenure as head of design. 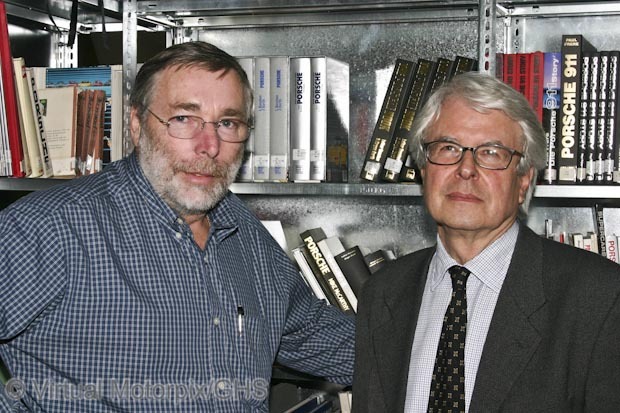 Other interviewees included Michael Hoelscher, the man responsible for penning the gorgeous Carrera GT, Klaus Parr, the Archive manager, and Dr Rabe who spent his whole life with the company in various admin-related positions, as well as several other important folk too. Tracing the name Carrera really did touch many different people, from racing drivers to admin personnel, designers to mechanics, and many more. It was the engine in the diminutive Panamericana 550 that was to be the first to carry the ‘Carrera’ name when it was simply referred to as that engine from those cars that raced in Mexico. Later a sporty 356 model was given this name, followed by the Carrera 6 (Porsche 906)…and so it went. 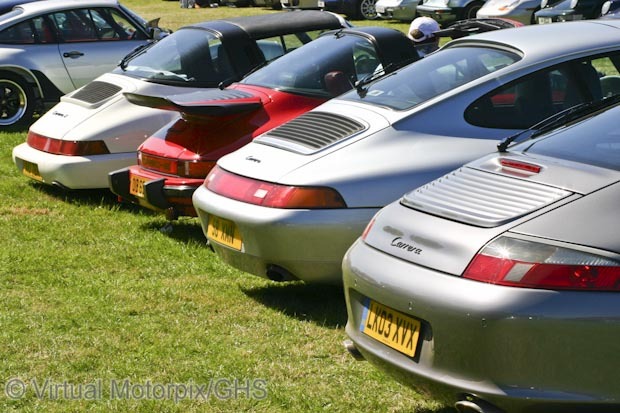 Carrera, which means ‘race’ in Spanish, was used in a number of different ways before it became a permanent fixture in the 1980s when Peter Schutz took over the reins of the company. It was this first book on the Porsche Carrera which opened the door to five more books on the famous marque from Stuttgart, and without any doubt, there will be many more to follow. It was this book too which led me to contribute to one of the UKs best known Porsche monthly magazine titles, Total 911, a relationship now a decade old and still going strong. The full and fascinating story can be found in the pages of: Porsche – The Carrera Dynasty which is offered at a 30% discount in our eBay shop for the next 2 weeks. Don’t miss out! A must for every Porsche historian. 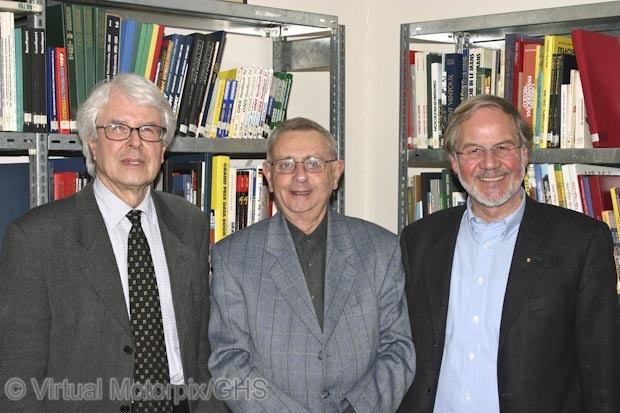 A series of interviews which is unlikely to be repeated in future. The names will remain but the people fade away….